This sailboat-inspired German home shows that the Netherlands isn't the only place that boasts notable floating homes. Located in the Lusatian Lake District, the AR-CHE Aqua Floathome by Steeltec37 is the beginning of a larger land and water housing development. The aluminum and steel-framed home has a high-performance facade that works to connect the interior with the exterior in an energy-efficient way. 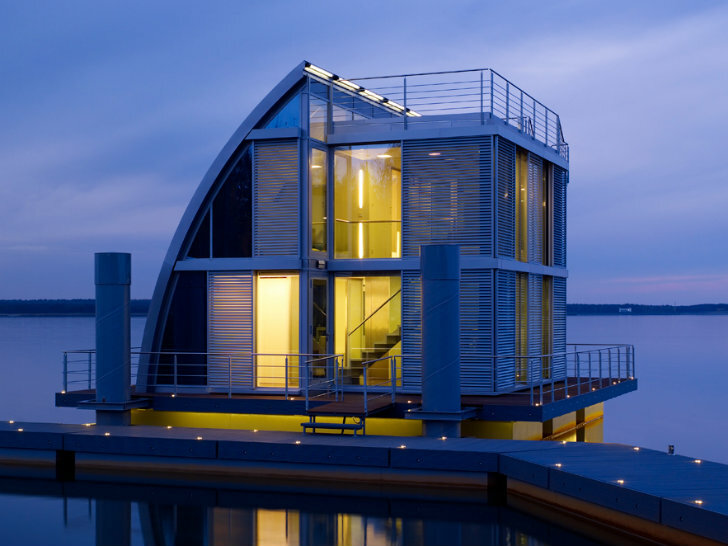 The AR-CHE Aqua Floathome is the first of several floating houses in the Lusatian Lake District by Steeltec37. This German company specializes in steel design for modular buildings on both land and water. Lausitz Resort will eventually have 9 modular land-based houses and 20 water-based homes like the one shown here. Ranging in size from 80-220 sq meters, the aluminum and steel homes feature curved roofs and are situated on unsinkable pontoons, which all lead back to the shore. Each home will enjoy water, sewage and electric hookups back to shore, as well as unique views of the lake and the landscape. The curved roof protects the home from the wind and weather, while the three other facades enjoy lots of windows to take in natural daylight and views. Louvered aluminum screens shield the interior from glare and overheating. The homes feature an innovative air-vapor barrier membrane and quality thermal insulation to finish out the high performance envelope. A variety of other energy efficient strategies were also employed to reduce overall energy use. This AR-CHE Aqua Floathome is the first of several floating houses in the Lusatian Lake District by Steeltec37. 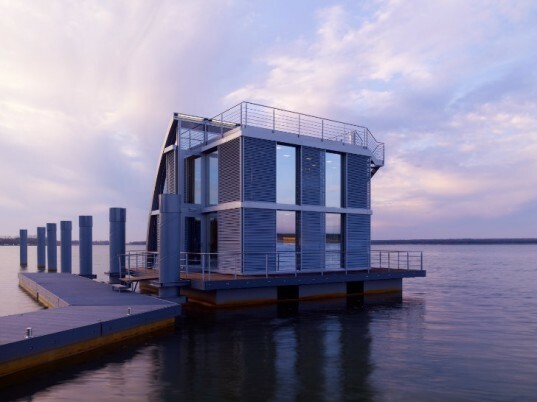 This German company specializes in steel design for modular buildings on both land and water. Lausitz Resort will eventually have 9 modular land-based houses and 20 water based homes like this one shown here. Ranging in size from 80-220 sq meters, the aluminum and steel homes feature a curved roof and are situated on unsinkable pontoons, which all lead back to the shore. Each home will enjoy water, sewage and electric hookups back to shore, but will enjoy unique views of the lake and the landscape. The curved roof protects the home from the prevailing wind and weather, while the three other facades enjoy lots of windows to take in natural daylight and views. Louvered aluminum screens shield the interior from glare and overheating. The homes feature an innovative air-vapor barrier membrane and quality thermal insulation to finish out the high performance envelope. A variety of other energy efficient strategies were also employed to reduce overall energy use. Drawing of the Ar-Che Aqua floathome.